Attorney General Jeff Sessions met twice with Russia's ambassador to the United States during the 2016 presidential election season, the Department of Justice confirmed, at a time when he was a close adviser to then-candidate Donald Trump. Sessions later did not disclose those discussions when questioned under oath during his confirmation hearing. The revelations, first reported by The Washington Post, sparked immediate calls for Sessions' resignation as well as fierce pushback from a White House official, who called them a "attack against the Trump administration by partisan Democrats." Questions about Russia and Trump associates' alleged contacts with the country have dogged the president for months, though he has repeatedly referred to them "fake news." His former national security adviser, Gen. Michael Flynn, resigned after misleading the vice president about his own conversations with the Russian ambassador. "I never met with any Russian officials to discuss issues of the campaign," Sessions said in a statement Wednesday night. "I have no idea what this allegation is about. It is false." 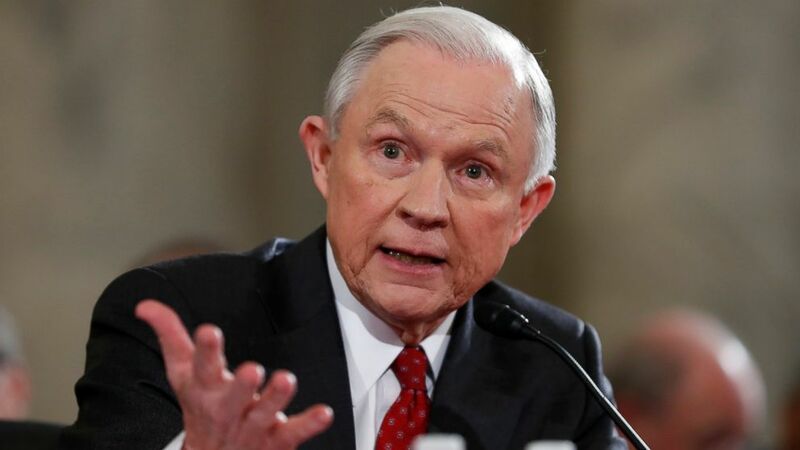 Sessions was specifically questioned by Sen. Al Franken, D-Minnesota, during his confirmation hearing about the alleged ties between Trump's campaign and Russia. "If there is any evidence that anyone affiliated with the Trump campaign communicated with the Russian government in the course of this campaign, what will you do?" asked Franken. "Senator Franken, I'm not aware of any of those activities," said Sessions. "I have been called a surrogate at a time or two in that campaign and I did not have communications with the Russians and I'm unable to comment on it." But Sessions did have contact with Russia on two occasions, including a meeting in his office with Ambassador Sergey Kislyak in September that was listed on his public schedule. "There was absolutely nothing misleading about his answer," said Sessions spokeswoman Sarah Isgur Flores. "Last year, the senator had over 25 conversations with foreign ambassadors as a senior member of the Armed Services Committee...He was asked during the hearing about communications between Russia and the Trump campaign -- not about meetings he took as a senator and a member of the Armed Services Committee." A Justice Department official said Sessions' meetings with ambassadors were in his capacity as a senator on the Armed Services Committee and about relations between the two countries. The official said that during the campaign season the ambassadors would make "superficial comments" about election news, but it was not the substance of the conversation. Information about Sessions' activities as a senator provided by the Justice Department official list 26 meetings with foreign ambassadors and government officials, including the one with Kislyak. The Washington Post story reports that Sessions also encountered Kislyak at a Heritage Foundation event in July. The Justice Department official described this interaction as a "brief encounter" and noted that a number of other ambassadors were present as well during the conversation. The DOJ official said Sessions was invited to join them at events that they were sponsoring and that Sessions made no commitments. Of the 26 members of the 2016 Senate Armed Services Committee, 20 said that they did not meet with Kislyak last year, according to the Washington Post. The additional senators did not respond to the Post's request for comment. Just over a year ago, in late February 2016, Sessions became the first sitting U.S. senator to endorse Trump during the Republican presidential primary. Less than a week later, the Trump campaign announced that Sessions would "serve as Chairman of Mr. Trump's National Security Advisory Committee." "It is an honor to have Jeff as a member of the team. I have such great respect for him and I look forward to working with him on the issues most important to Americans," said Trump at the time in a statement from the campaign. "I am grateful for the opportunity to recommend and facilitate discussions among exceptional and experienced American military and diplomatic leaders to share insight and advice with Donald Trump, regardless of their political views," added Sessions. ABC News' Chris Donovan contributed to this report.